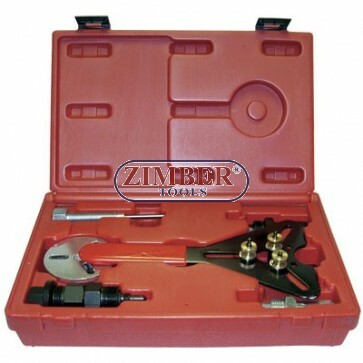 Trusa universala pentru demontat aer conditionat, ZR-36ACHTK - ZIMBER TOOLS.Trusa montare demontare furtun combustibil si aer conditionat -BGS TOOLS. Trusa universala pentru demontat aer conditionat, ZR-36ACHTK - ZIMBER SCULE. SET DEMONTARE AMBREIAJ COMPRESOR HARRISON, DENSO , SANDEN, TECUMSEH, YORK ZEXEL SISTEM CLIMATIZARE AER CONDITIONAT. Clutch Hub Installer and Remover..
20 Pieces Including 7-1/4 In Spanner. Multiple Removers and Installers Included. For Use With Most Domestic and Import Compressors. Custom Fitted Blow Molded Case and Directions Included.